Unclogging your kitchen or bathroom sink doesn’t have to be a job for the professionals. Before you try breaking up the blockage yourself, consider these best practices to prevent damaging your pipelines. Most homeowners never think about maintaining their sinks—at least, not until it starts to drain agonizingly slow and the basin fills with dirty standing water. Unfortunately, kitchen and bathroom sinks are bound to be partially or fully obstructed at some point. A majority of back-ups originate from the trap, which is the U-shaped pipe located underneath the fixture. Although the trap is necessary to stop sewer gases from leaking into your home, the curved form of the pipe may cause quite the headache. If water isn’t flowing freely at your home, don’t call the plumber just yet. Most drain blocks are easy to fix without professional help. 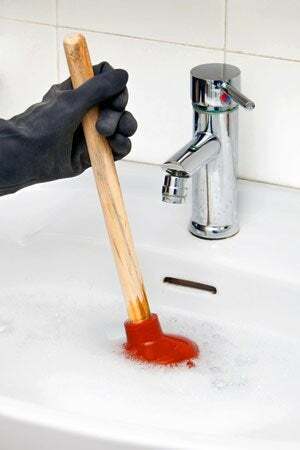 Follow this guide to save time and avoid costly mistakes when unclogging a sink. 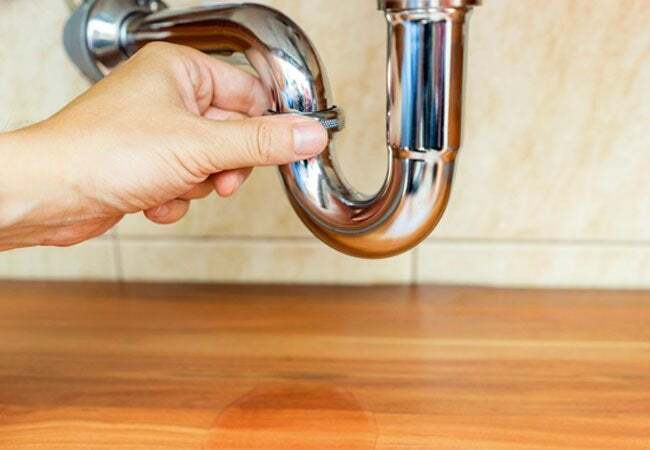 Food residue can leave a buildup of grease in drainage pipes, especially if the drain is connected to your garbage disposal. 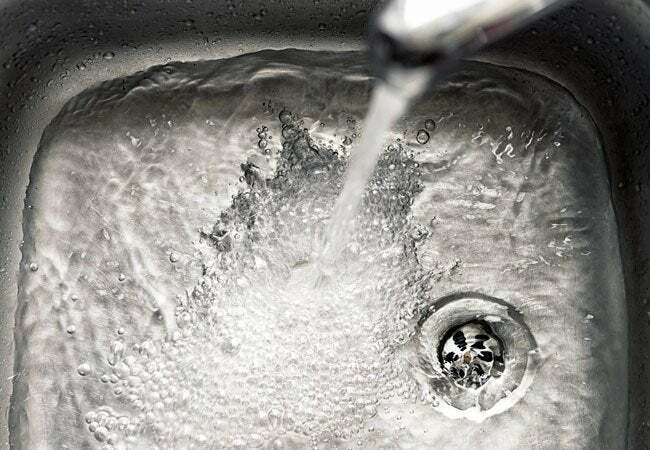 If you suspect your slow-draining kitchen sink’s plumbing is lined with greasy sludge, pour about a tablespoon of dish soap and a large pot of boiling water into the drain. The hot water should cause the grease to break up and dissolve enough to unclog the sink. In the future, take care not to dispose of oil or food scraps in the garbage disposal or down the sink drain. Stop that faucet! If the standing water in your sink isn’t draining at all, the worst thing you can do is add more water to the basin. The additional water pressure won’t actually flush out the blockage, and you’ll have to bail it out before attempting a more effective de-clogging method. Many homeowners reach for a chemical drain cleaner upon discovering a clogged sink, but these caustic solutions can soften PVC pipes and even damage older metal pipes. And then there’s the personal harm it can cause: Stray chemical splashes can burn your skin and eyes. If you want to put a commercial drain cleaner to work, consider purchasing a biodegradable one, which utilizes enzymes to eat away at clogs. These biodegradable options don’t work quite as quickly as chemical cleaners, but they’re safer and will protect your pipes. Stoppers and strainers are common trouble spots in bathroom sinks, since hair can easily wrap around the strainer and trap soap scum. To loosen this sort of clog, bend a sturdy wire to form a hook at one end. Remove the stopper if needed by twisting it counterclockwise, pulling it upward, or using a screwdriver to unfasten it. Then insert the wire into your sink drain, twist, and pull the blockage out. If the clog is in the drainpipe, you might be able to loosen it with a standard cup plunger. Some clogs simply need an extra “push” to get moving! Make sure the sink contains a few inches of water, and block the overflow drain with a wet rag so that water doesn’t leak out. Then place the rubber suction directly over the sink drain and firmly plunge up and down. Warning: Only attempt unclogging a sink like this if you haven’t already poured chemical cleaner into the sink. Otherwise, as mentioned, the hazardous material can quickly splash onto your skin while you use the tool. Should moderate plumbing fail to remove your sink’s clog, don’t force the matter. And in that same vein, refrain from using a drain bladder; also known as a blow bag, this garden hose attachment inserts directly into the drain and uses water pressure to clear it. Unlike bathtub and shower drain traps, which are permanently connected, sink drain traps connect with twist-off couplings. Excessive pressure can damage the drain line connection, resulting in leaks or a ruined trap. A plumber’s drain snake, or auger, features a long coiled cable with a hook or sharp cutter on the end. You can purchase a manual auger at your local hardware store for about $30. To use one, remove the sink strainer and insert the tip of the augur down the pipe and twist the hand crank, which releases the wire cable. Keep feeding more of the snake into the drain until you feel resistance—this signals that you have reached the clog. Rotate the auger to break up the blockage. If your auger hits a blockage, don’t forcefully pound at the clog. This motion can damage your trap connectors or pipes. Obstructions that can’t be cleared with an auger should be handled using a different method. The majority of sink clogs occur in the curved drain trap beneath the sink—the pipe is usually shaped like a P, S, or J. Removing the trap may be the easiest way to loosen the jam. Bail excess water from the sink, and then place a bucket under the drainpipes (since the trap holds water and will release it when undone). Twist the connectors loose and remove the trap. From here, you can clear away a clog by gloved hand. If you discover that the clog lies further down the drainpipe, stick in your auger and get to work. If the methods listed here don’t fix the problem, you could be facing a clog elsewhere in your home drainage system. This may require the help of a professional plumber, who could use a powered auger or other device on the main line. Incorrectly working with unfamiliar tools could cause damage to the drain lines, so it’s best to call for backup whenever you’re uncertain.